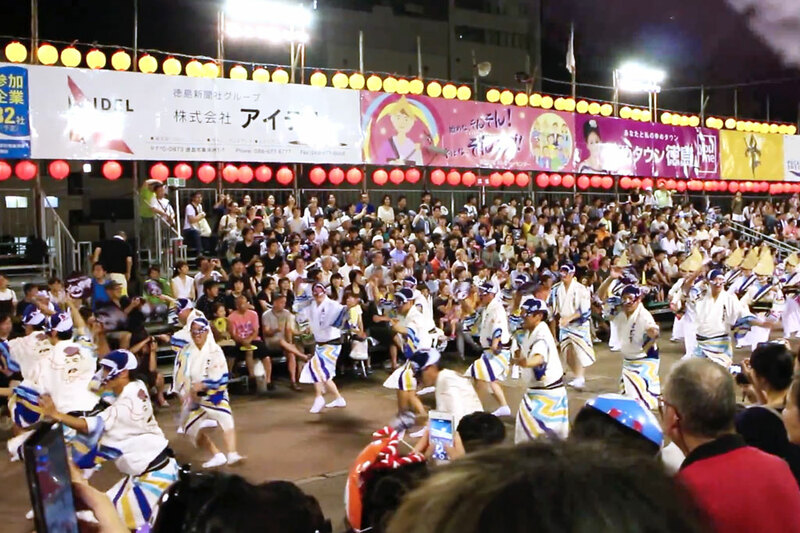 As I'm sure you all know already, the main Awa Odori event in Tokushima takes place between 12th and 15th August, rain or shine. This year, by special invitation, I was able to join in the festival in the garb of one of the biggest name teams in the country, Ebisuren! As the name may suggest, there is some connection between Ebisuren and my own team, Tokyo Ebisuren. They've certainly made themselves available to provide advice and assistance over the years, but there's currently no formal affiliation, which is what made the invitation something of a big deal for me. 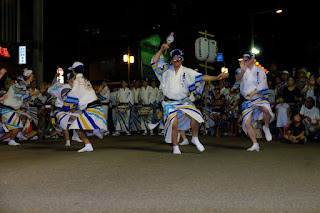 In the nearly six years I've been learning Awa Odori, the opportunity to perform in Tokushima with Ebisuren as one of their own has been something of an ambition I've had from the start. Now, Tokushima is pretty far away, and at the height of its tourism season it's not easy to find accommodation, and especially not of the reasonably affordable type, so we ended up entering via Takamatsu in Kagawa Prefecture, staying in a kind of local varient of a bed and breakfast the first night, a shrine the second night, and flying out of Tokushima on the final day. This meant I got to perform on 13th and 14th. And probably just as well I didn't stay longer. It was absolutely exhausting! Parade grounds are much shorter, wider, well lit, and the audience are seated. Mostly they're situated in riverside parks. Despite the shorter length, I found them to be much more exhausting, which I put down to a number of factors: the shorter length meant I could concentrate my efforts rather than pacing myself to preserve my strength; there was room around me to move—Tokyo performance spaces are often quite cramped allowing insufficient room to give a full performance range; audience expectation was very high, as was the level of expertise of all my team mates, and I certainly wasn't going to let the side down. Number of performances are fewer than in Tokyo, despite the longer time frame. Some Tokyo festivals have us perform up to 7-8 times within a two hour window. In Tokushima we only performed 3-4 times over a four and a half hour period. This meant there was a lot of time to enjoy the festival as a festival, eat food from the stands, drink beer, chat with other guests etc. A lot of the time was spent carrying drums from one end of the city to the other, which was really quite tiring though. No water. This was a big deal for me. It meant I was burning through money trying to stay hyrdrated. Team captains dance at the front. This may only apply to the big name association teams, but there's an expectation that team captains will lead the procession behind the giant lantern. This just isn't seen in Tokyo. 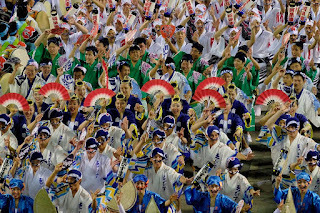 Soh odori. 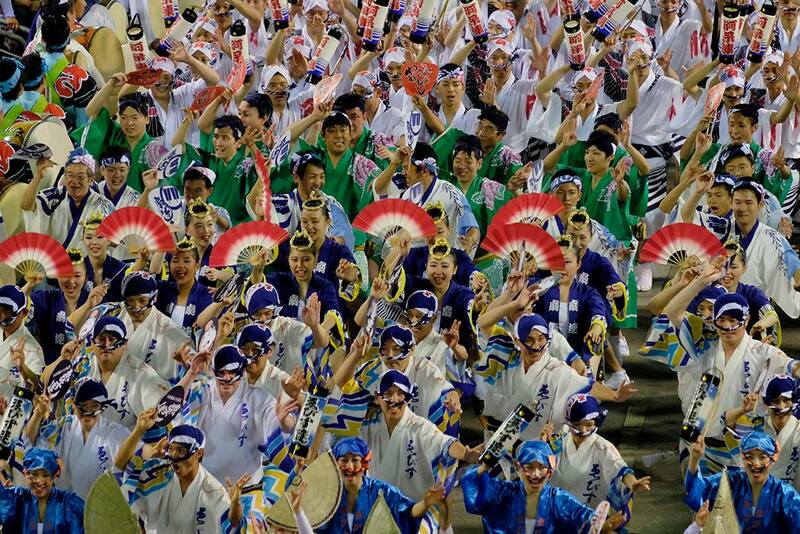 The very last event of each evening is a grand finale called the soh odori (general dance). Here, a whole bunch of the association teams parade through together, filling the performance space entirely. It's impressive to watch, and it's always the sounds of the many many shamisen that gets me. What's less well known is how chaotic it is behind the scenes as people with megaphones are trying to get everybody in with some kind of dignity. As I'd gone from having a third of the width of a performance space to myself to only a sixth, it did feel more like a Tokyo festival. Very cramped! One cute detail is the ritual of "cleansing" the performance space before the finale. This is done by a local university team called "Rererenoren" who are modelled after a very minor character in a long running popular cartoon series. It's a curious dance they do, and this year they were accompanied (perhaps unwittingly) by one of the best Awa Odori flutists I've heard, from about 1 minute in on the above linked to video. Wa Odori. This is similar to the set pieces we have in Tokyo. Everybody forms a large circle and the performers come on in groups and do a part each, but it seemed to me to be more relaxed, more like the B side of a record. There's a lot of humour to it, and a lot of trying out of new material to see what works. Generally it's a lot of fun. I was suddenly asked to perform with the rest of the out of towners for one section, with the instruction to play it by ear. That seemed to work out ok.
That's most of the chief differences. All in all it was a great experience, and one I can hopefully bring some lessons back to Tokyo from. 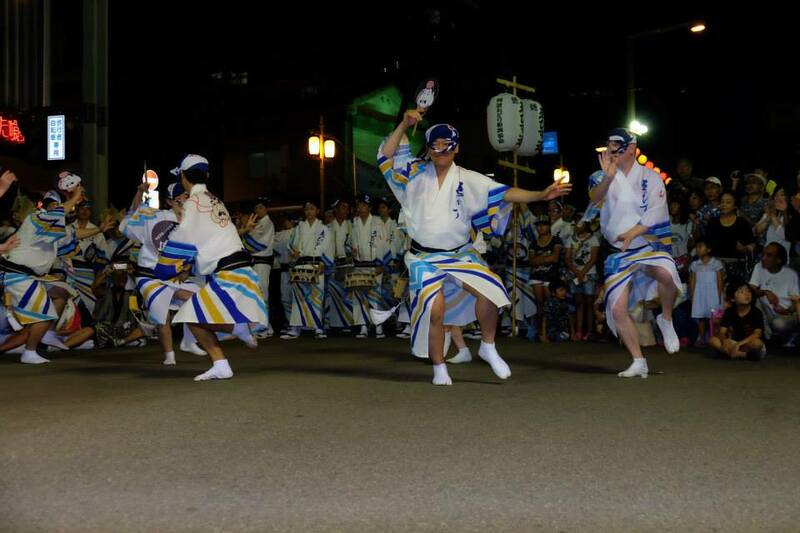 My next performance isn't for another couple of weeks now, Koenji Awa Odori on 29th August. Returning the favour somewhat, several members of Ebisuren will be joining us in our costumes, to help give our team a little more impact. Which ones they are you will have to work out for yourselves.